Founded in 1955, Allweather Insulation is a family owned and operated company. We install insulation in homes and businesses. We install fireplaces in homes and perform commercial fireproofing. We serve customers from north Florida to south Georgia. For detailed information regarding our services, please review the tabs above. Allweather Insulation is an approved insulation provider for the City of Tallahassee. For more information about the programs available through the City of Tallahassee, including free energy audits, visit the City of Tallahassee website. We are proud to be part of a true American industry. Fiberglass insulation supports the U.S. economy, businesses, and jobs from beginning to end. 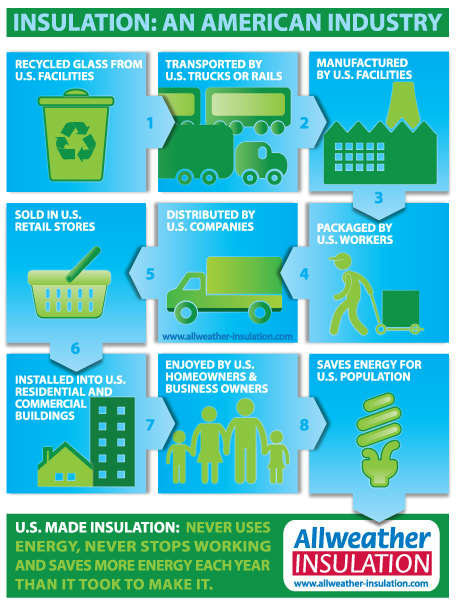 Save energy, save money, support American jobs by hiring an insulation contractor! Did you know upgrading your insulation could do all that?